Accessories: Accompanied by Patek Philippe presentation box with outer packaging, Certificate of Origin stamped by Relojeria Alemana, leather wallet and product literature. 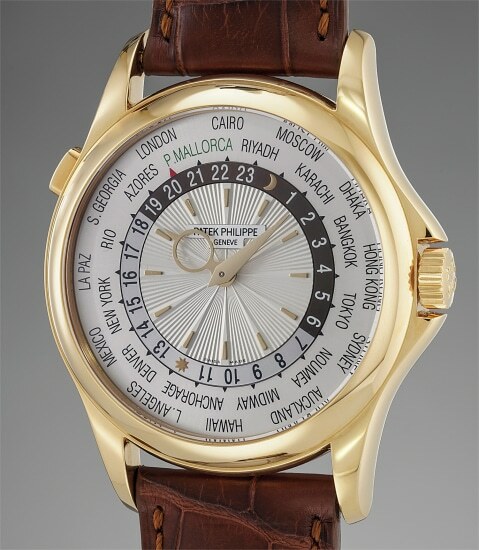 Patek Philippe’s worldtime reference 5130 made its debut in 2006 replacing the previous traveler’s watch reference 5110. Keeping the ingenious system invented by master watchmaker Louis Cottier in 1935, the watch allowed the wearer to view multiple time zones simultaneously. Available in four metals: yellow, white and pink gold as well as in platinum, the model was much sought after by travelers around the world. In 2014, faithful to its reputation of offering their clientele with unique pieces, and to commemorate its 135th anniversary, Relojeria Alemana commissioned Patek Philippe with an exclusive order of eight reference 5130s, two in each available metal. The watches displayed the time zone for P. Mallorca highlighted in green, emphasizing its importance and contrasting wonderfully against the silver dial. Offered in untouched condition and for the first time on the market the present yellow gold example represents a scarce chance to own such a stunning piece as Relojeria Alemana kept a full set of four watches for their private collection.